The hardest part of reviewing Descender #3 from Jeff Lemire and Dustin Nguyen is giving away too much of the story. I want to share all the great details to explain what a joy it is to read. Something happens that is so unexpected and eerie that to spoil it would somehow diminish the twist. There aren't many books you'd want to keep to yourself and cherish, but Descender is one of them. It's more than just sentimentality that makes me so protective of such a great book and lead character. TIM-21 is a wide-eyed little boy, albeit a robotic one, thrust into a world he doesn't quite understand with only his trusty robot dog, Bandit. That premise alone will hook most folks by the heart. The fact that the poor kid shares DNA with the humongous world destroying robots that left the colony in ruins ten years earlier and now has him marked for death with bounty hunters hot on his trail is enough to get your pulse racing. Doctor Quon, TIM's creator, is en route along with a team of scientists to find him and examine the link that ties him to those "Harvesters." The problem is TIM's entanglement with the "Scrappers" left him in dire shape with only a drilling robot to attend to him. Can the team reach him in time? It's that type of constant danger that permeates TIM's existence yet it's what happens to him during his battle to survive that is most fascinating. Lemire is a master of wringing emotion from situations without feeling manipulated as the reader. Nguyen's magical touch with watercolors creates an almost dream-like world. It's amazing what he can do with a single color as he gives birth to a new landscape, a new structure with a twist, a stroke or a swipe of his brush. Yet, as impressive as the layouts may be, it's the innocence in TIM's face, the determination of Driller, the sterile confines of UGC's ship that conveys so much personality and dimension. 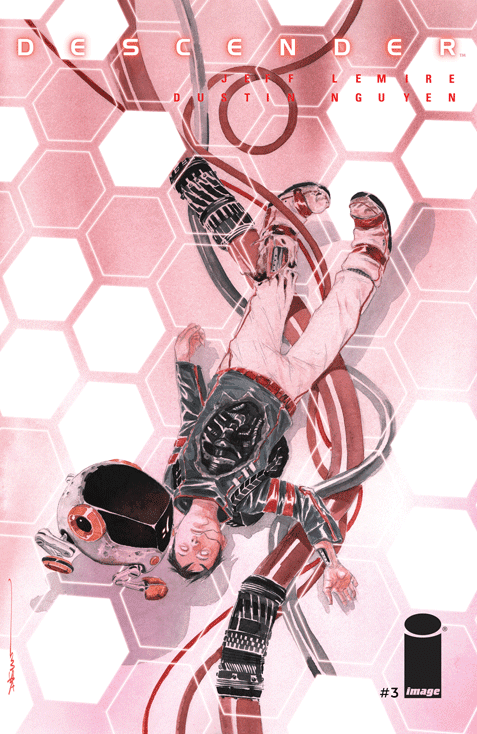 Descender #3 (of 5) is a special series full of heart, danger and excitement. An experience unlike anything you're reading right now. Iron Giant or E.T. comes to mind when looking for something comparable. It's that good.